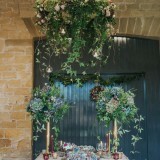 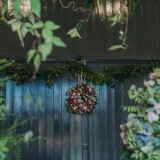 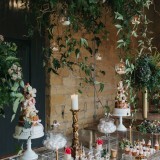 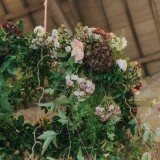 You’d be forgiven for thinking an entire garden had gone into the creation of today’s styled shoot. 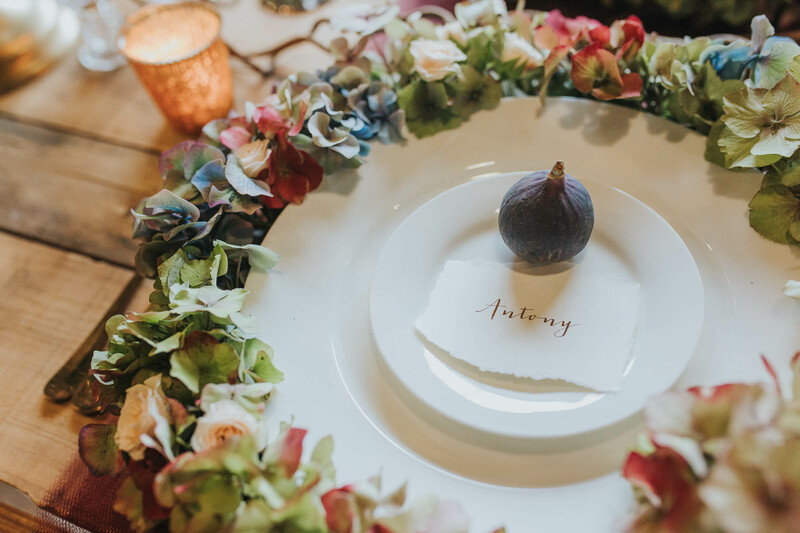 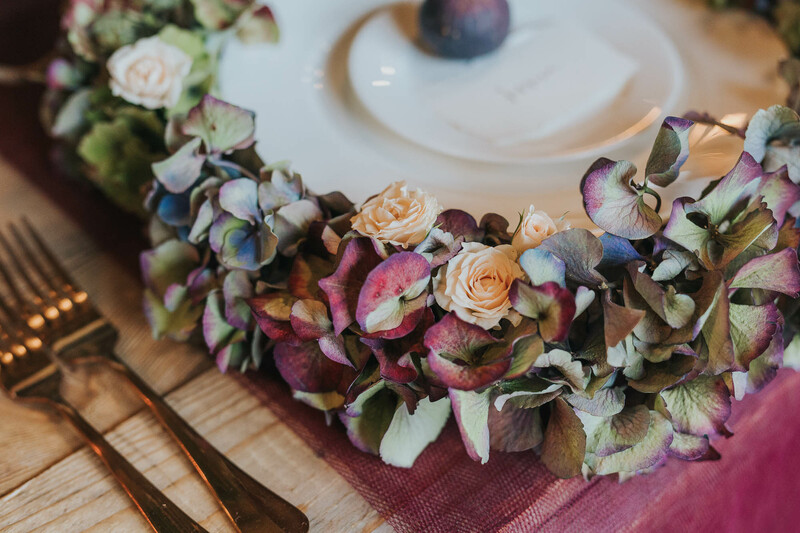 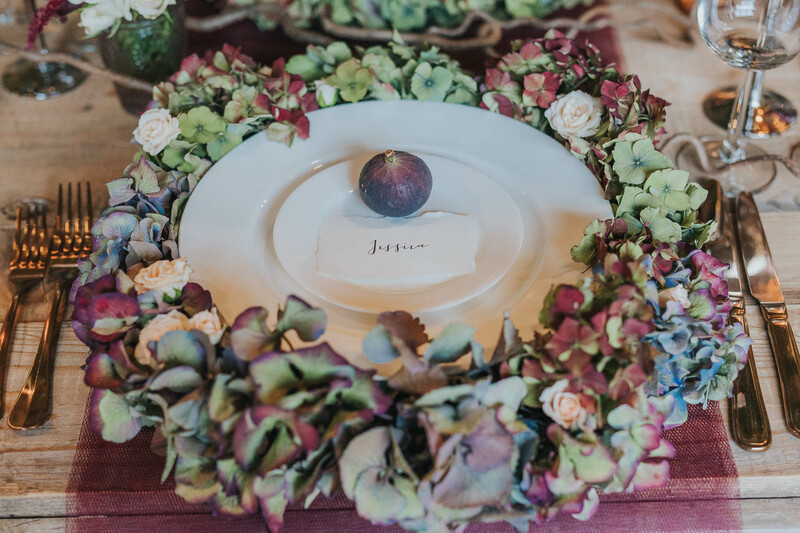 The frothy floral creations bursting with abundant rich greenery brought together by our wonderful Sponsor Leafy Couture, plus the most wonderful sweet treats gracing the dessert table (and the cute little tomatillos on the place settings), are enough to turn our eyes heart-shaped! 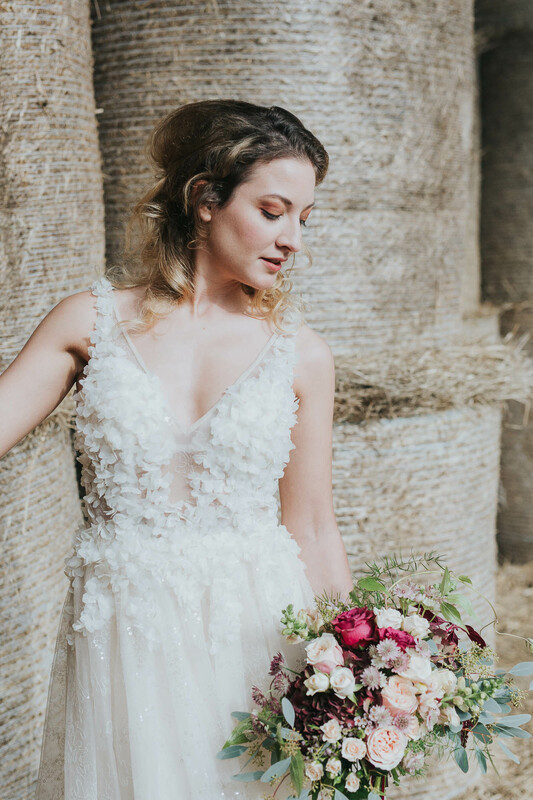 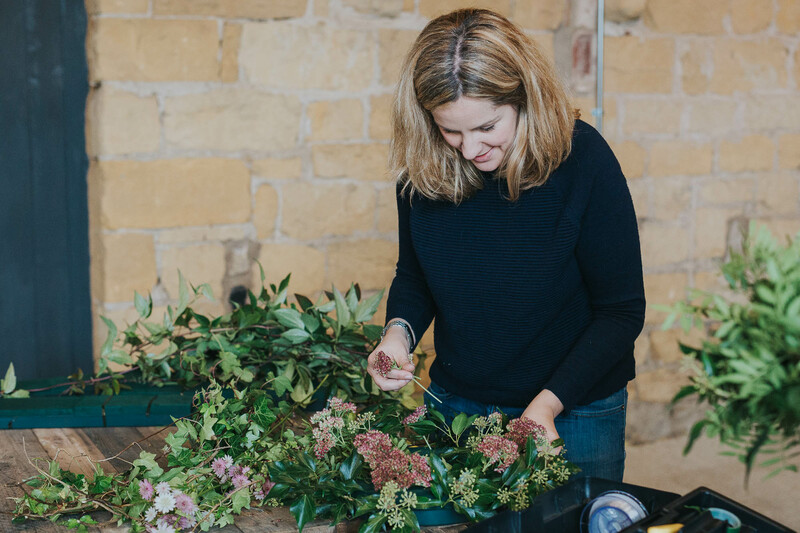 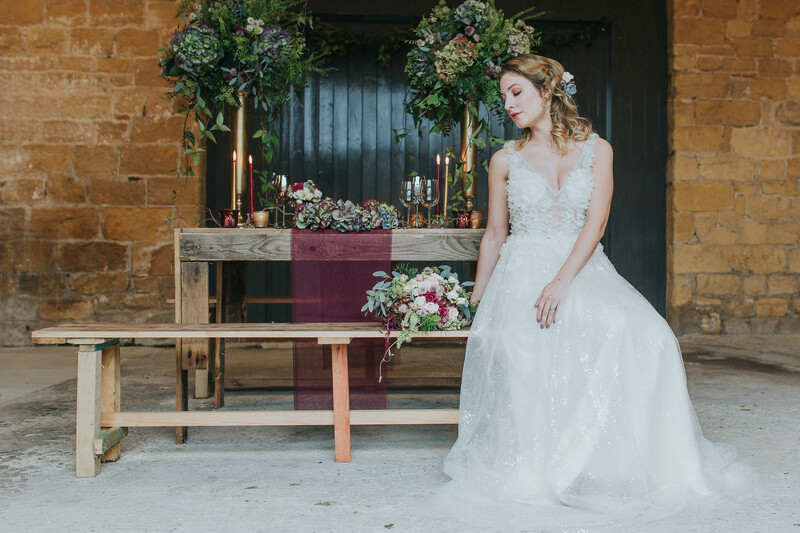 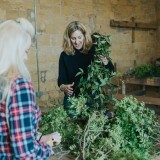 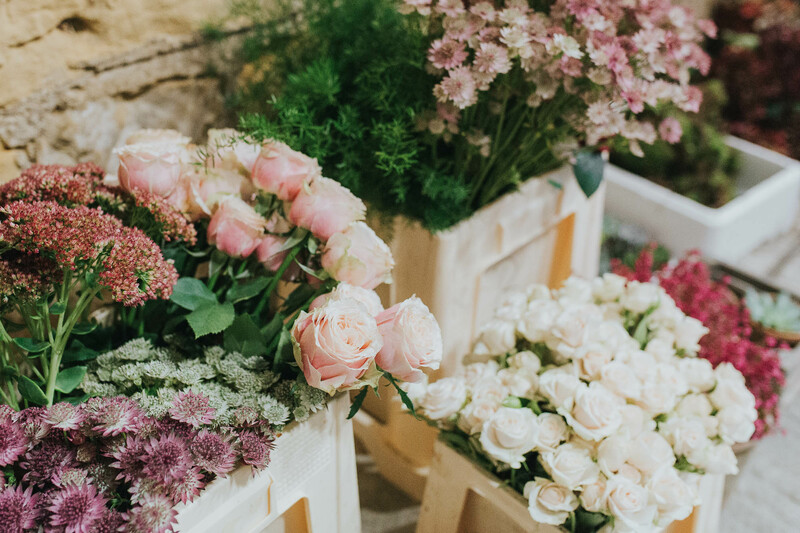 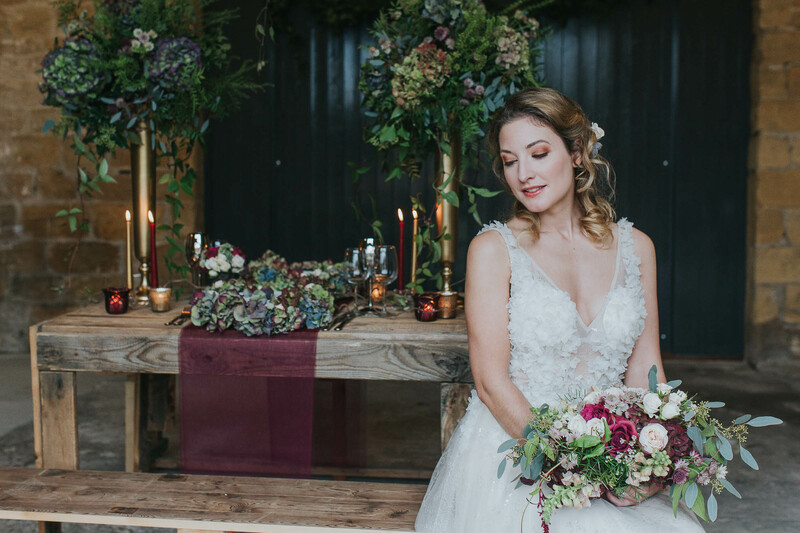 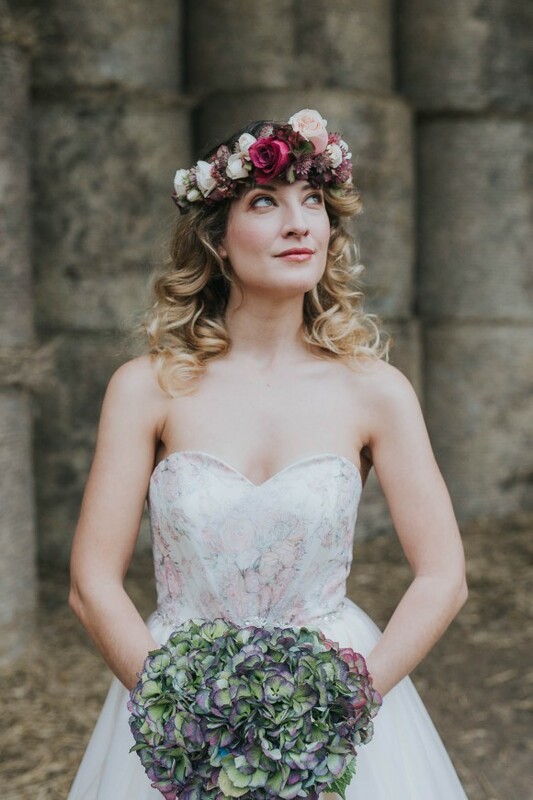 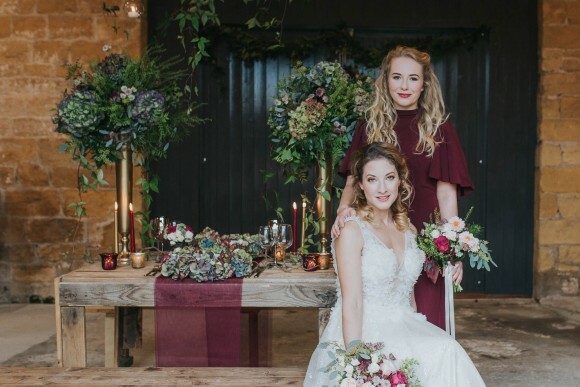 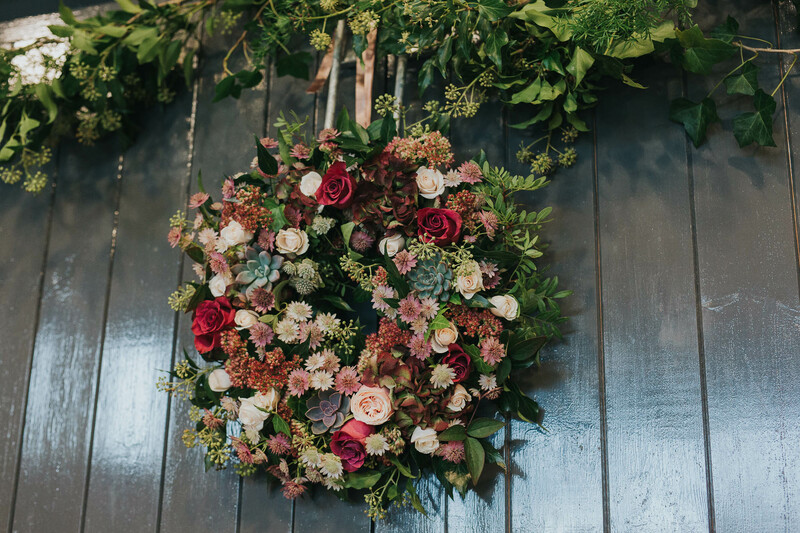 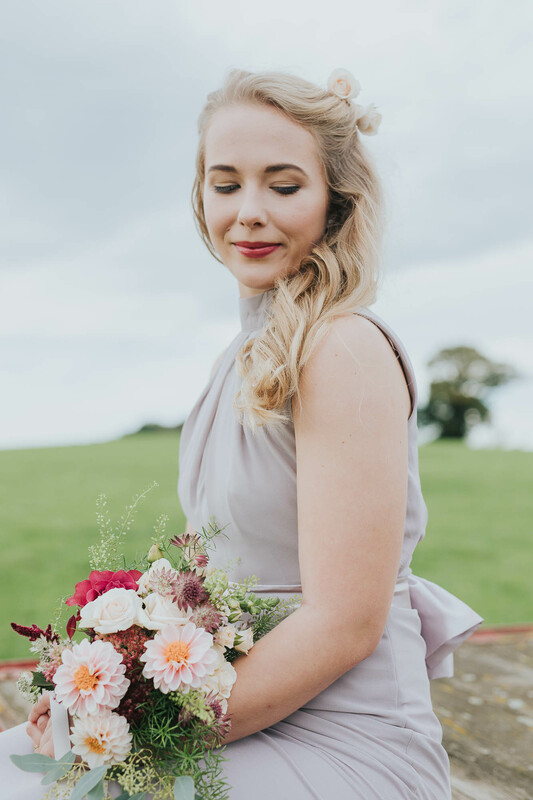 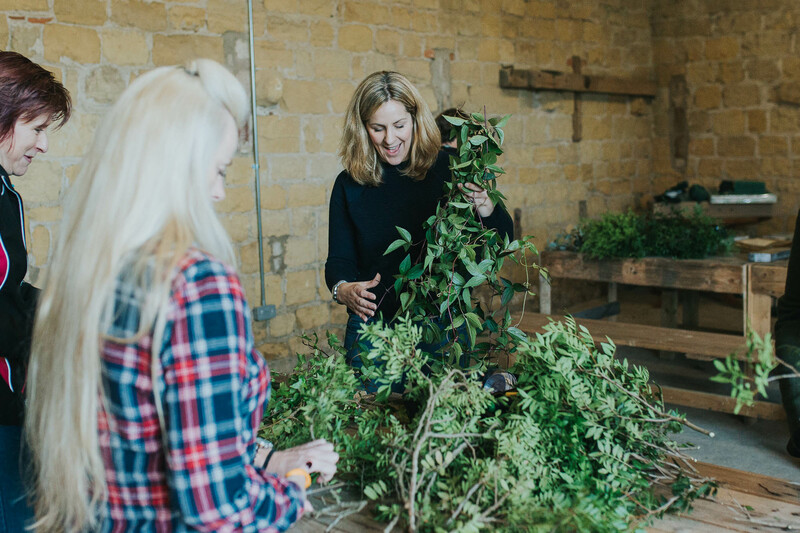 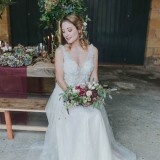 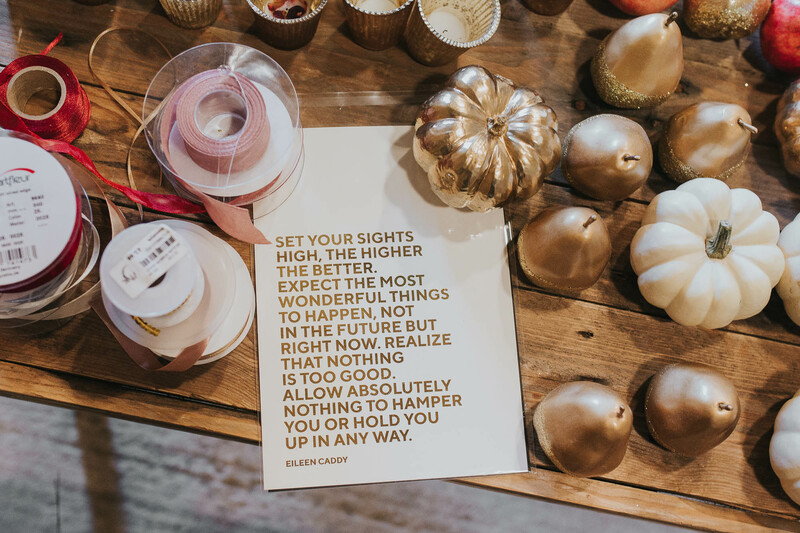 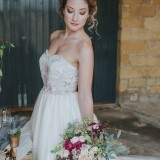 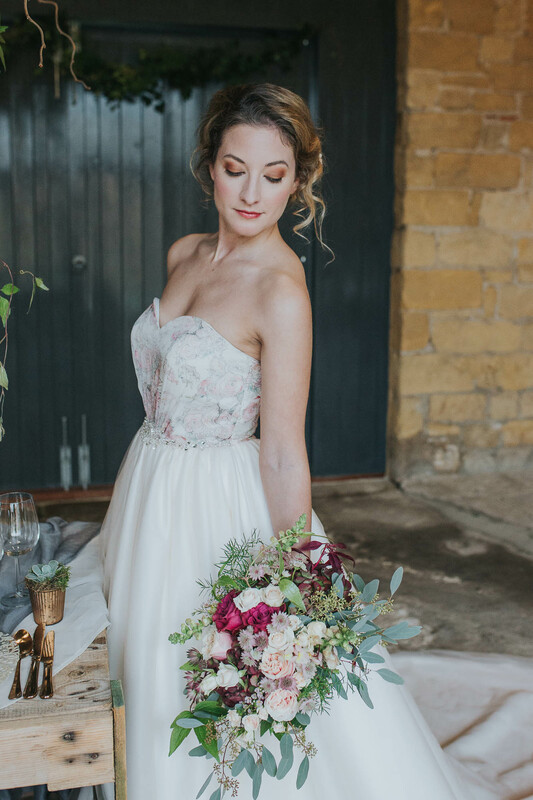 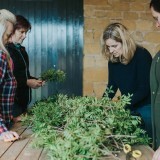 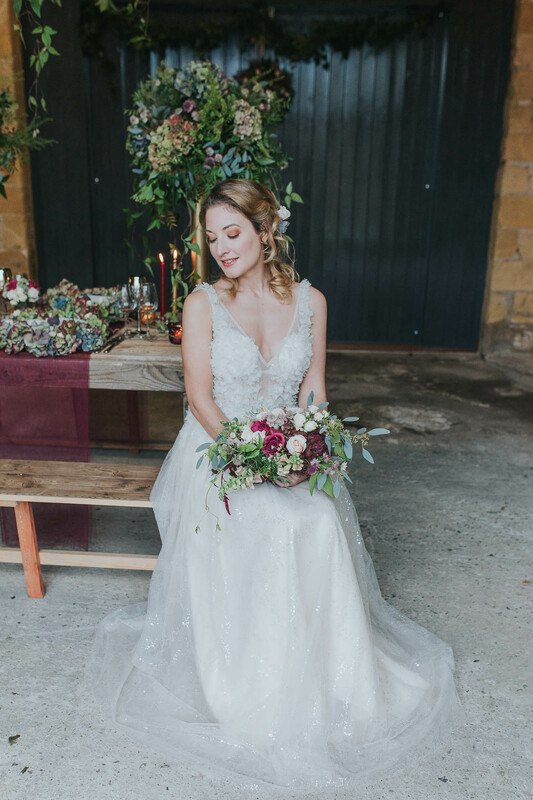 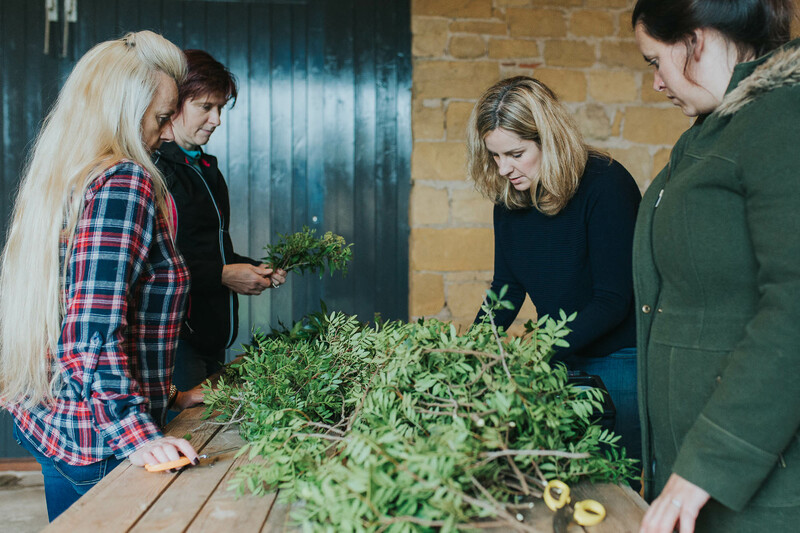 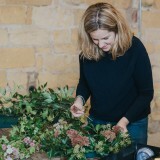 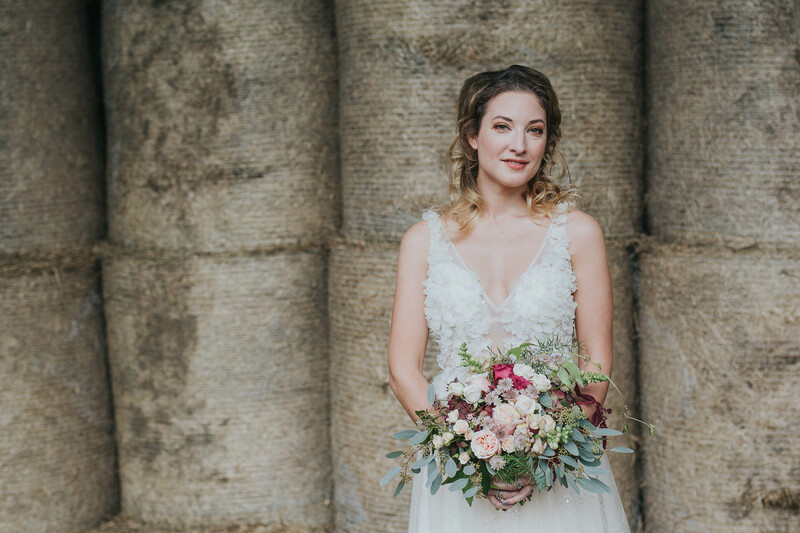 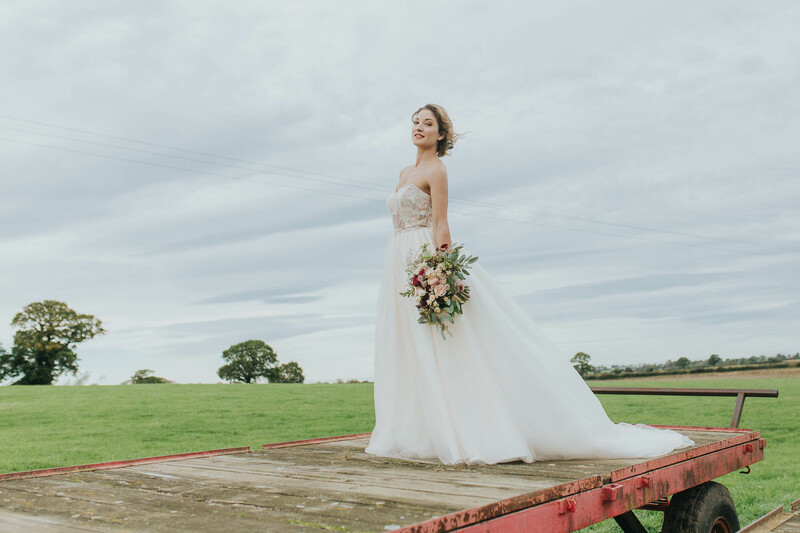 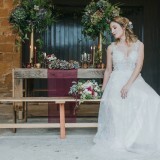 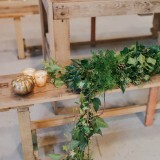 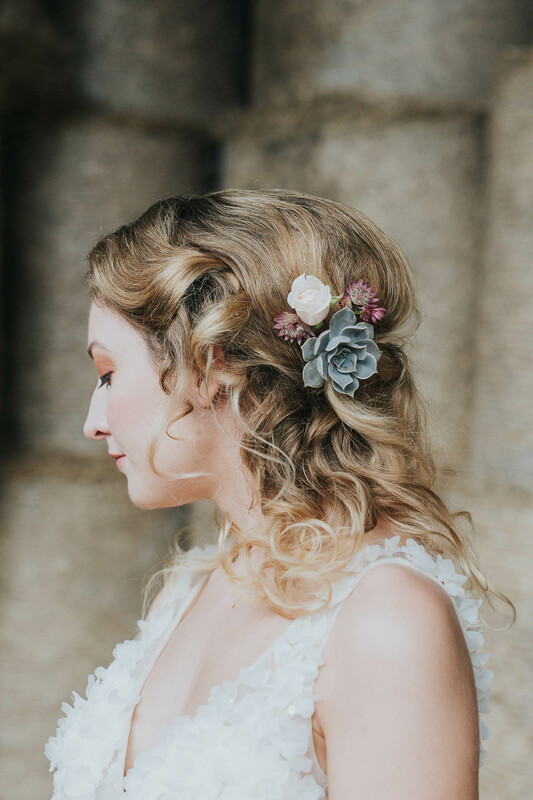 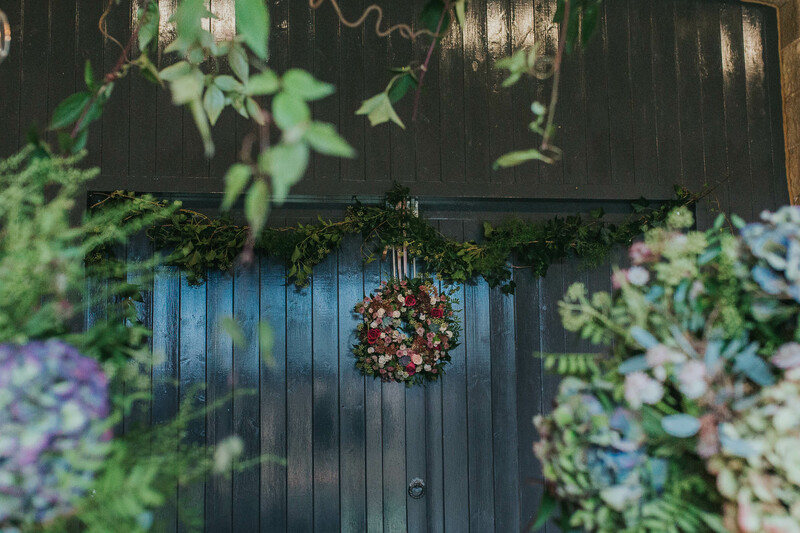 The shoot was orchestrated by florist extraordinaire Sarah of Leafy Couture, who runs flower classes, including DIY wedding flower classes for beginners and hen party flower crown tutorials – great options for our crafty brides-to-be out there! 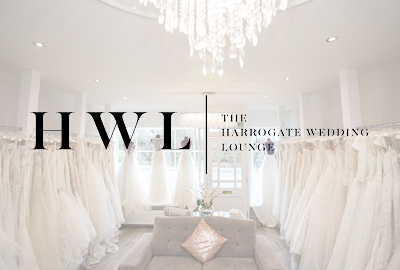 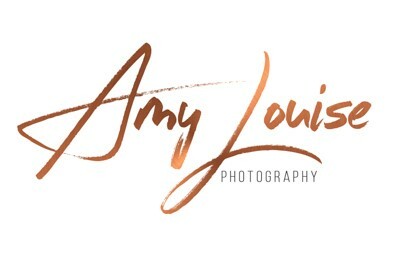 With images by Brides Up North Sponsor, Laura Calderwood Photography. 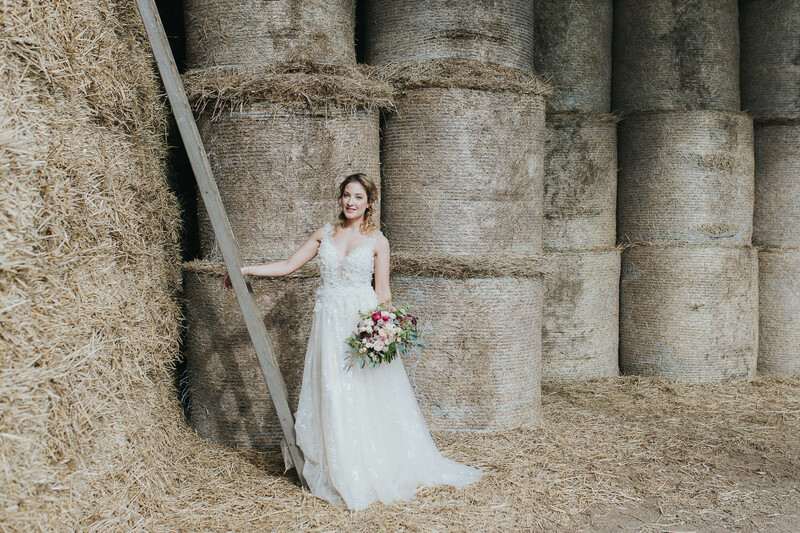 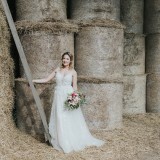 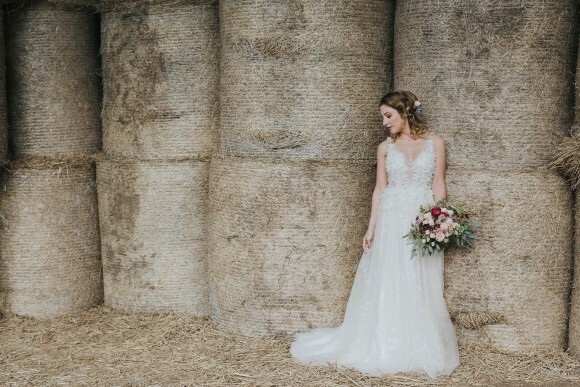 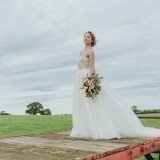 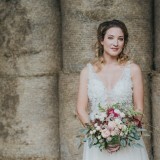 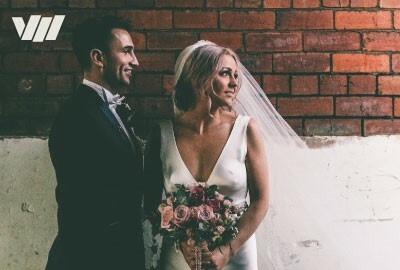 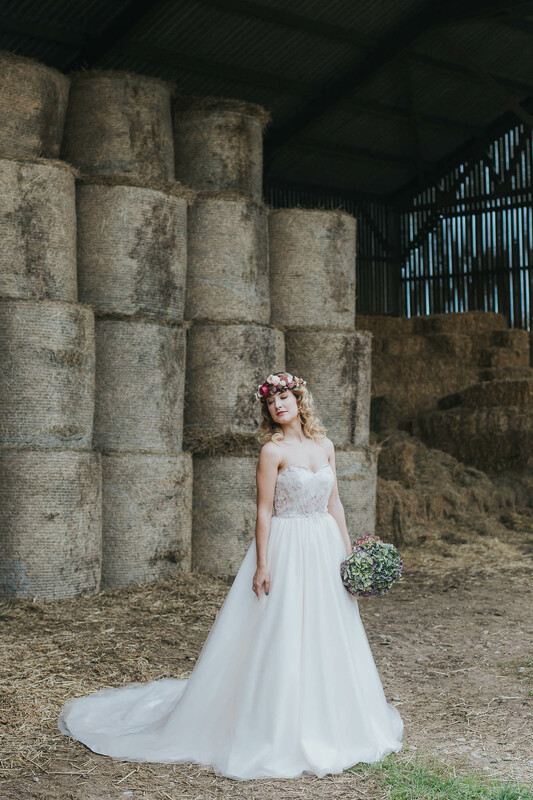 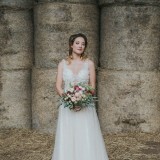 sarah says: Castle Farm Barn in Knaresborough, is a beautiful space in a gorgeous setting; the perfect blank canvas. 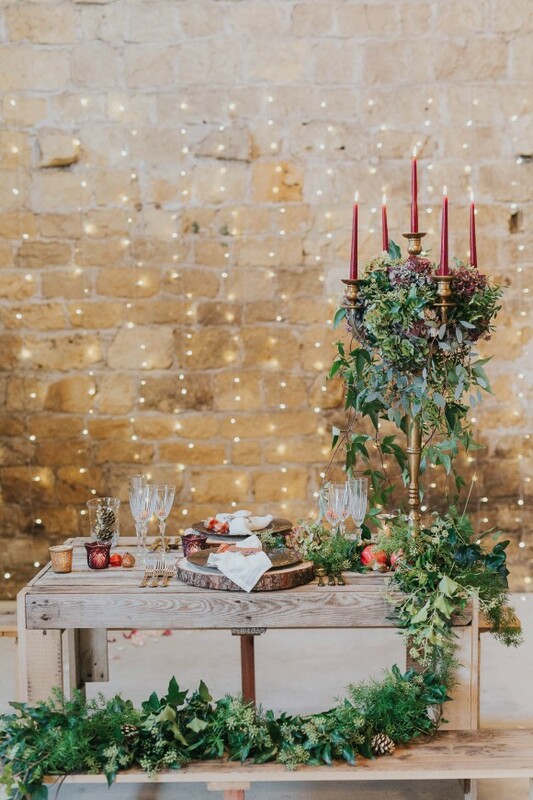 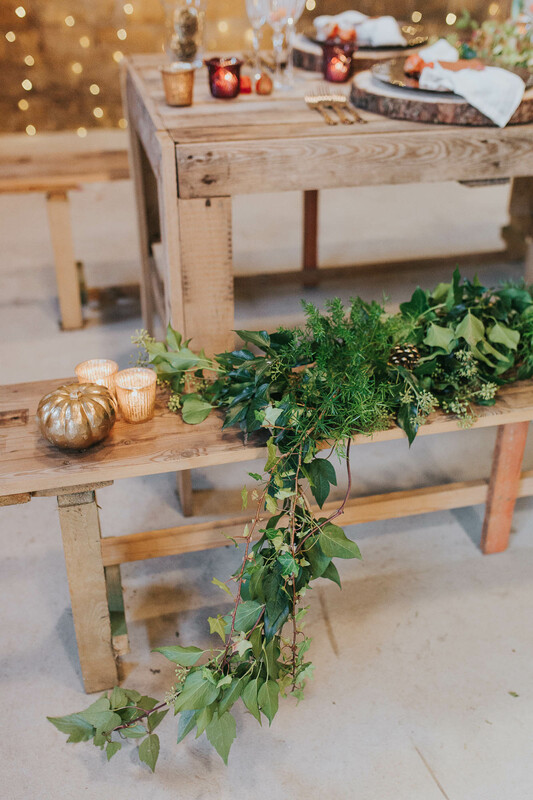 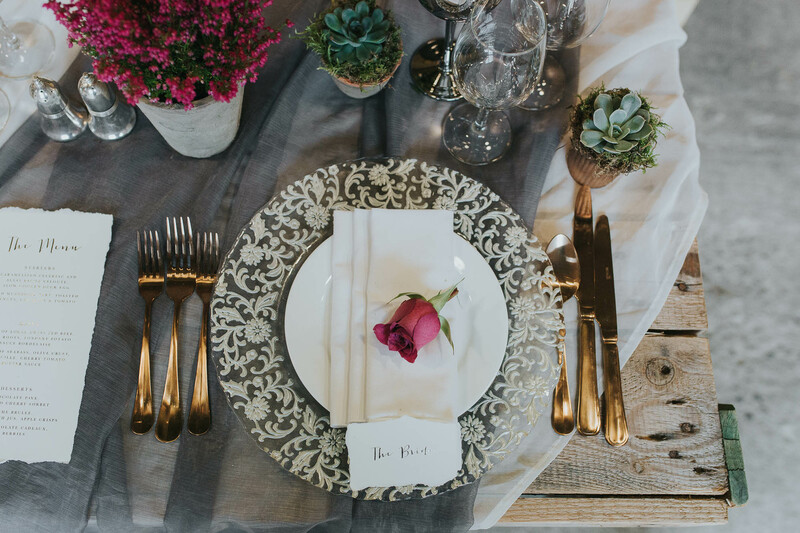 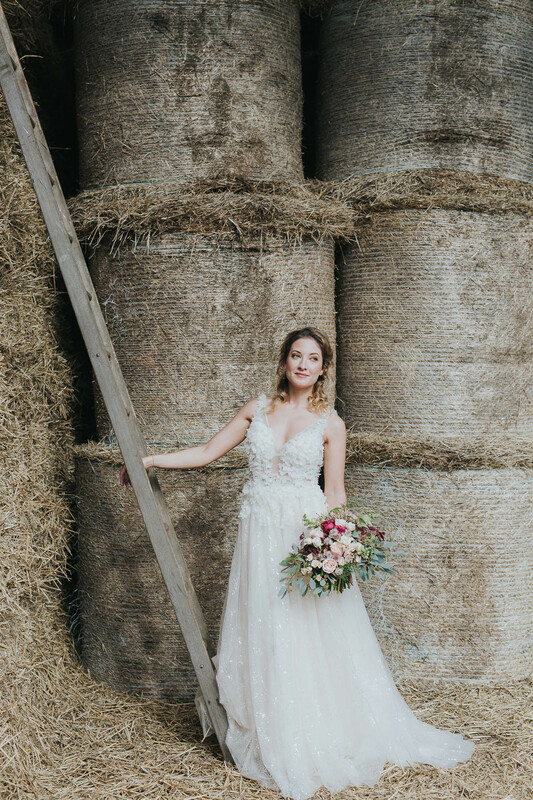 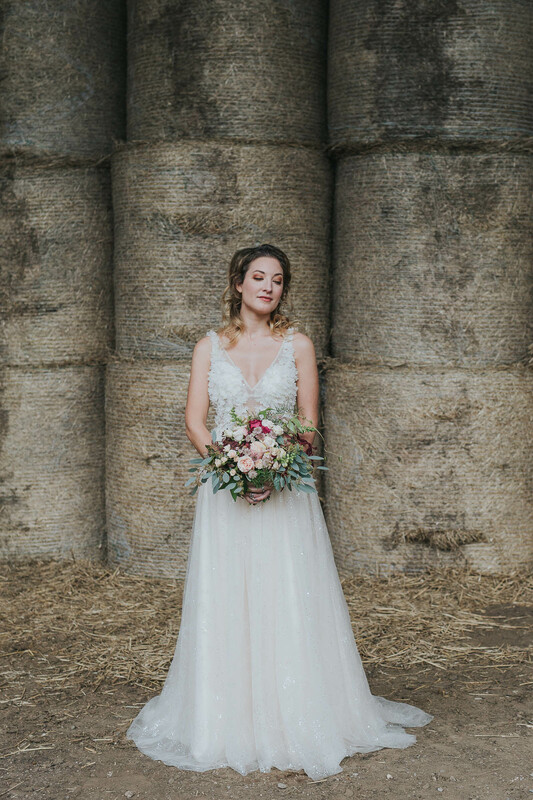 The inspiration for our styled shoot was the fact we really wanted to show how to make the tables stand out and add interest to a barn space. 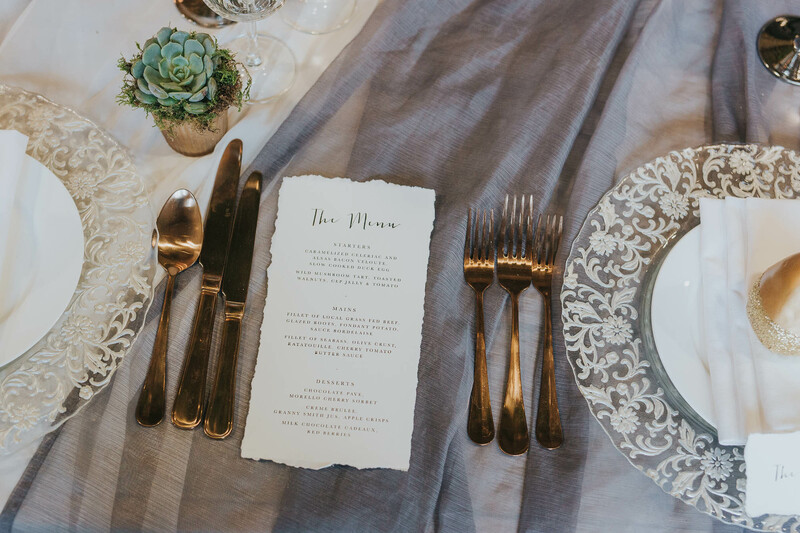 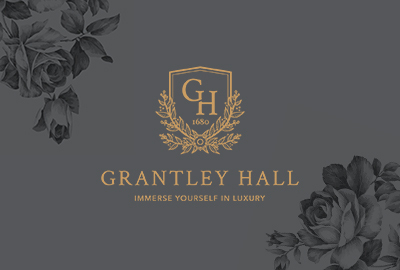 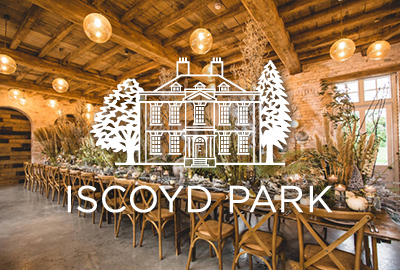 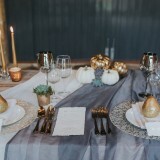 We wanted to portray a luxury feel while keeping a country vibe, using textured foliage and seasonal-inspired tones. 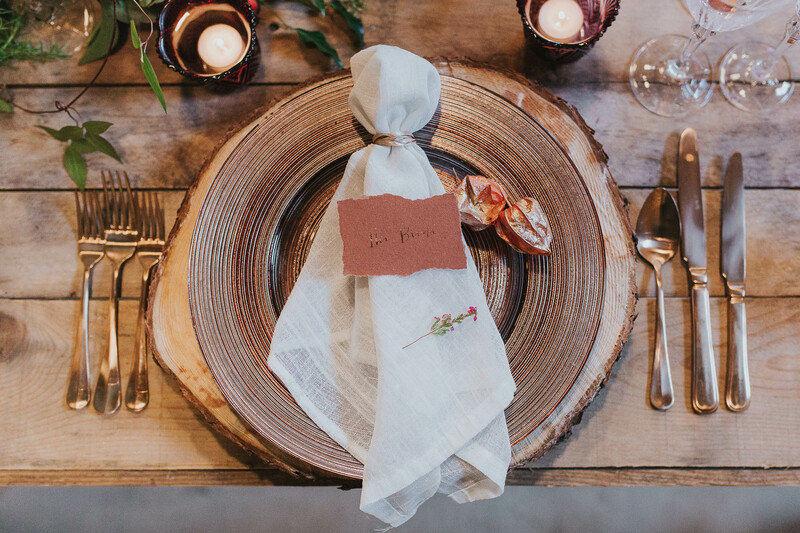 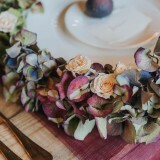 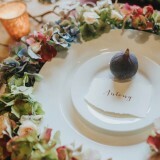 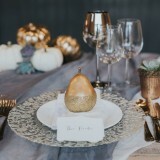 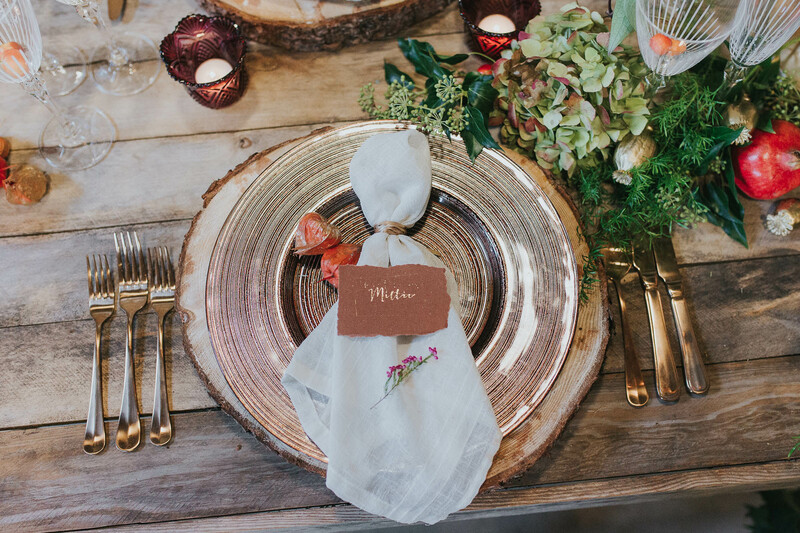 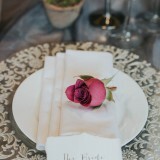 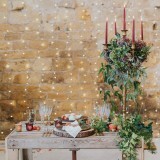 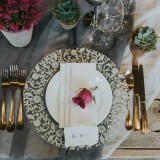 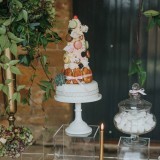 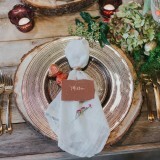 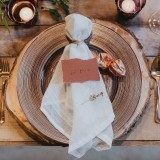 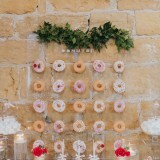 Small details were added, such as autumn fruits and velvet ribbons, to complement the linen and tableware. 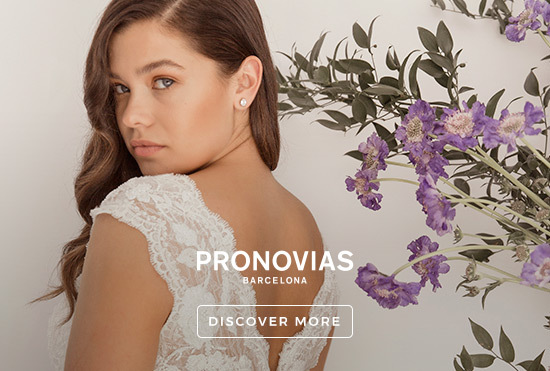 Bridal P.A. 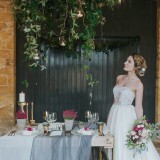 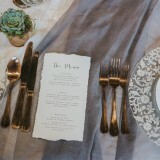 styled the shoot, assisted by L27 Weddings. 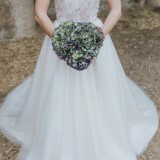 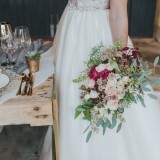 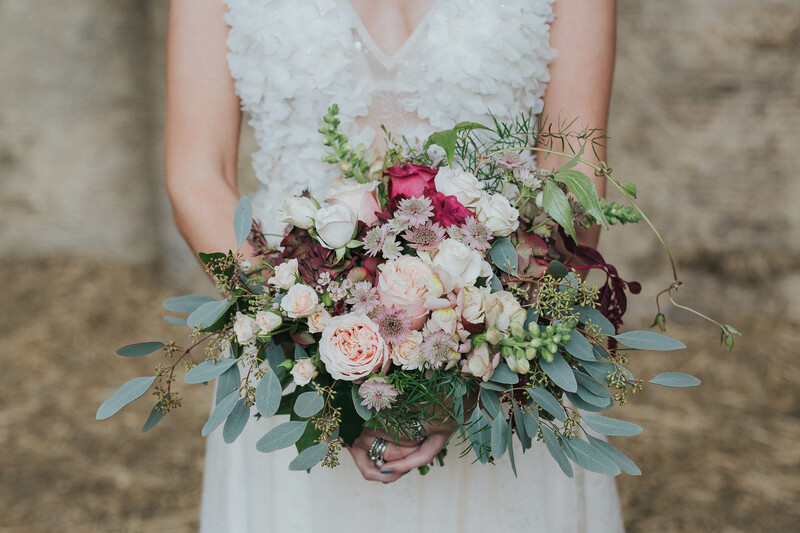 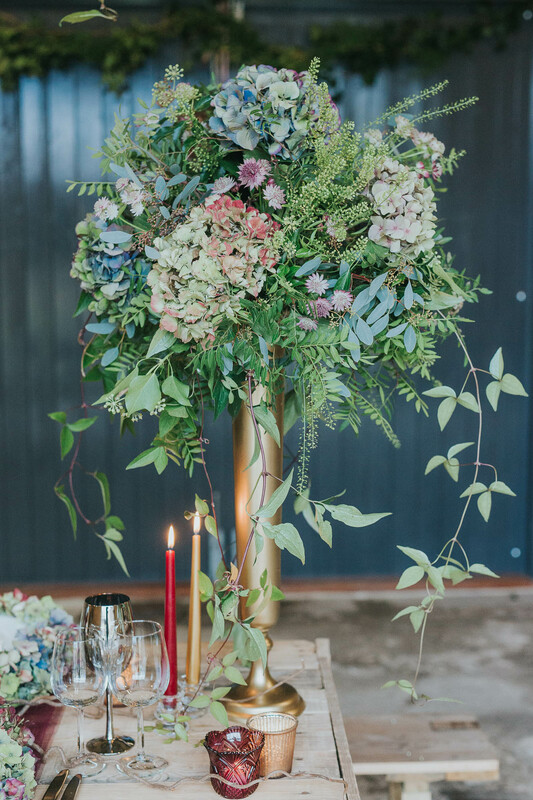 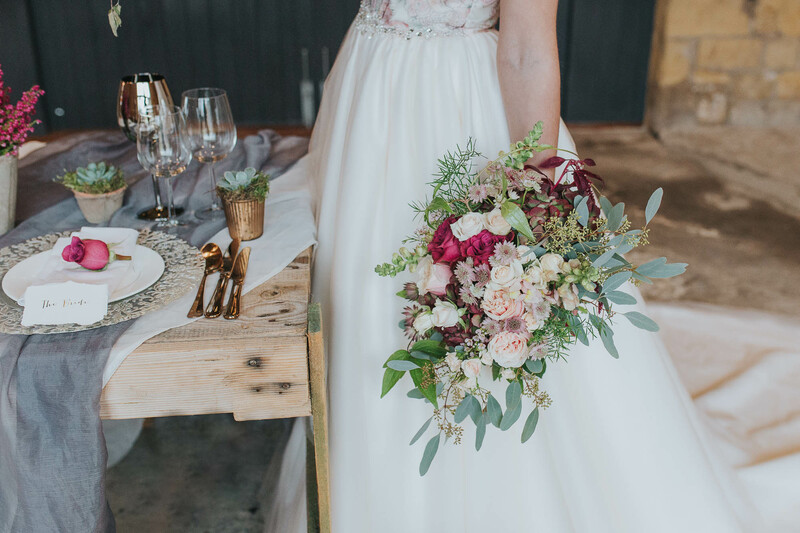 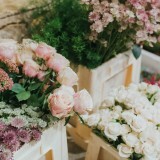 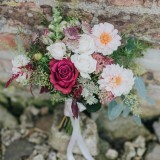 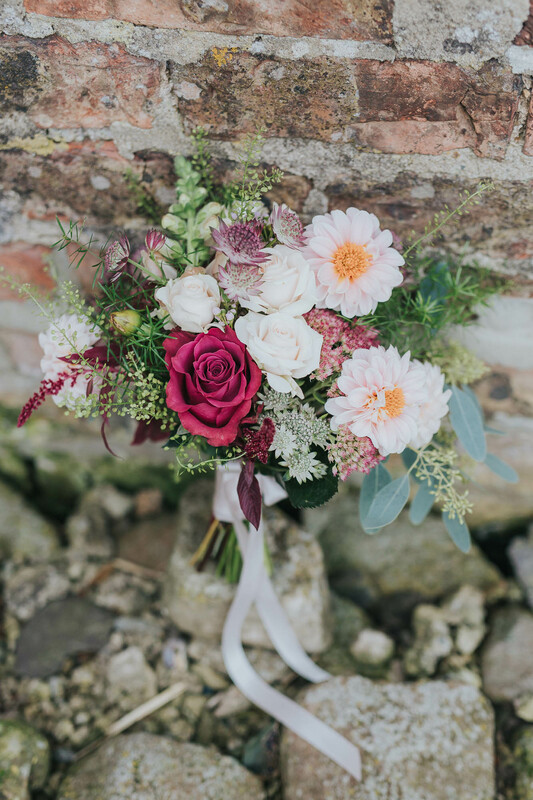 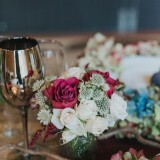 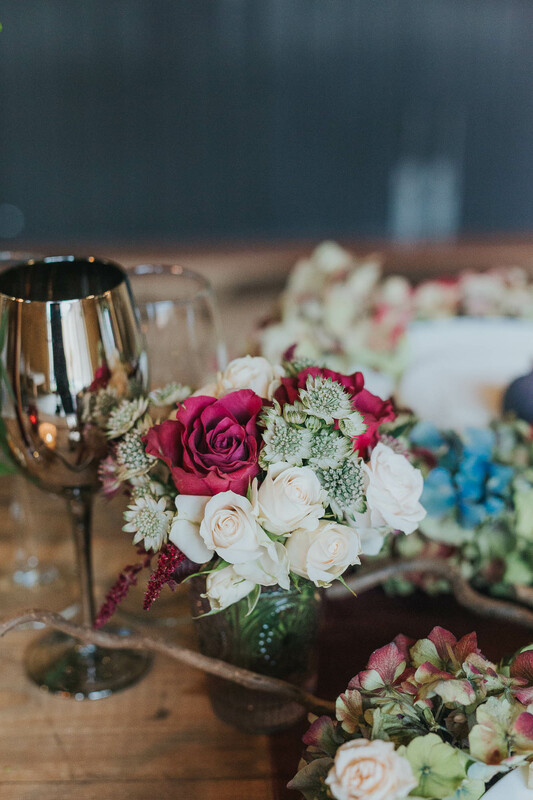 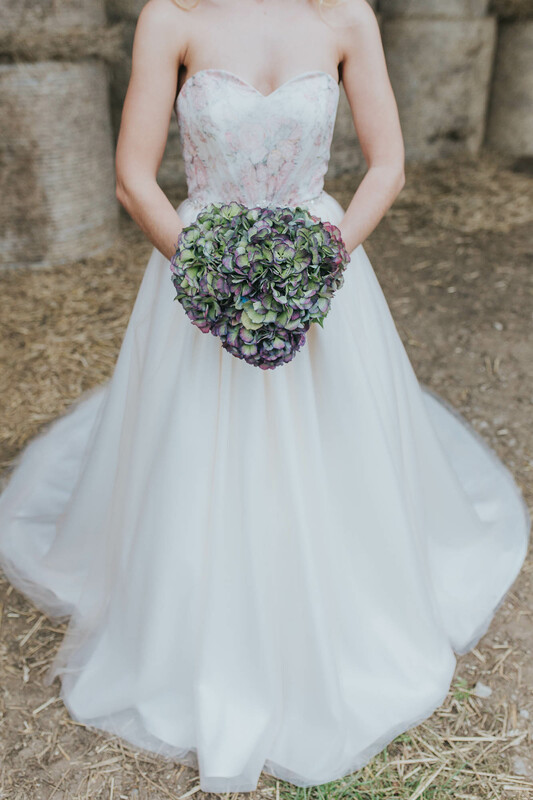 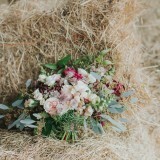 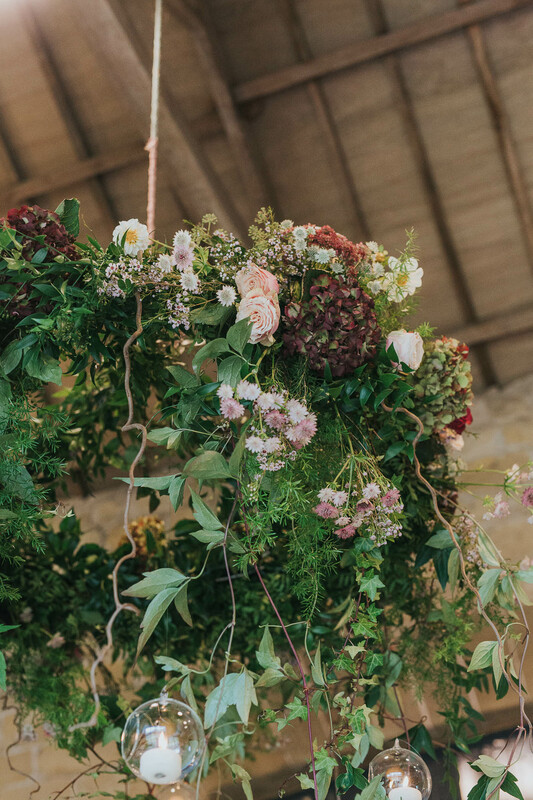 In the bouquet, we used beautiful seasonal flowers, including antirrhinums, avalanche roses, eryngium, eucalyptus parvifolia, wax flower, succulents, astilbe and prunus. 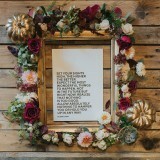 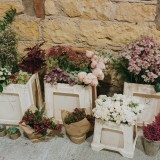 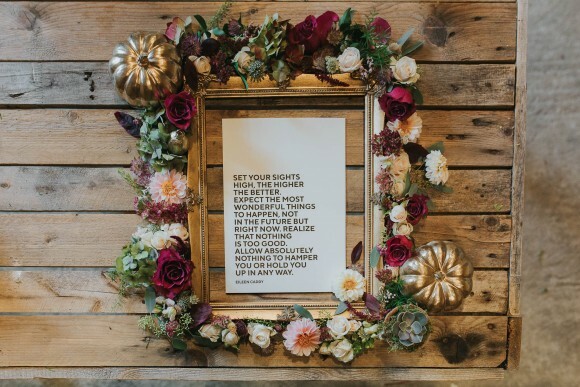 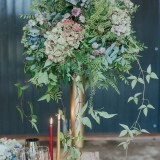 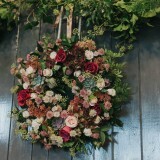 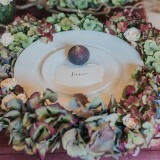 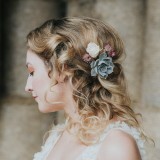 In the frame, we used succulents, wax flower, eryngium, tuberose, astilbe, moss and ranunculus. 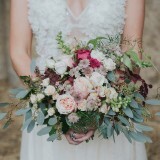 The buttonholes comprised an avalanche rose, euc parvi, wax flower and succulent, while the wrist cuff showcased a succulent, wax flower and viburnum tinus. 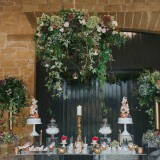 We were assisted in the floristry by The Mindful Florist, Inspirations 288 and Sandra’s Flower Studio. 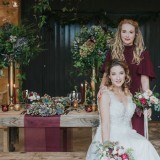 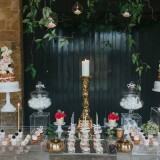 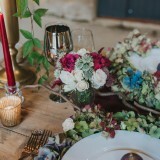 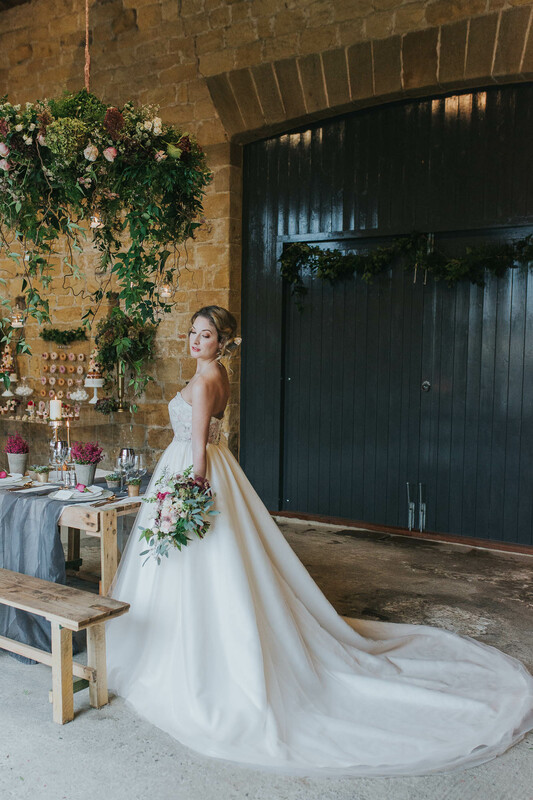 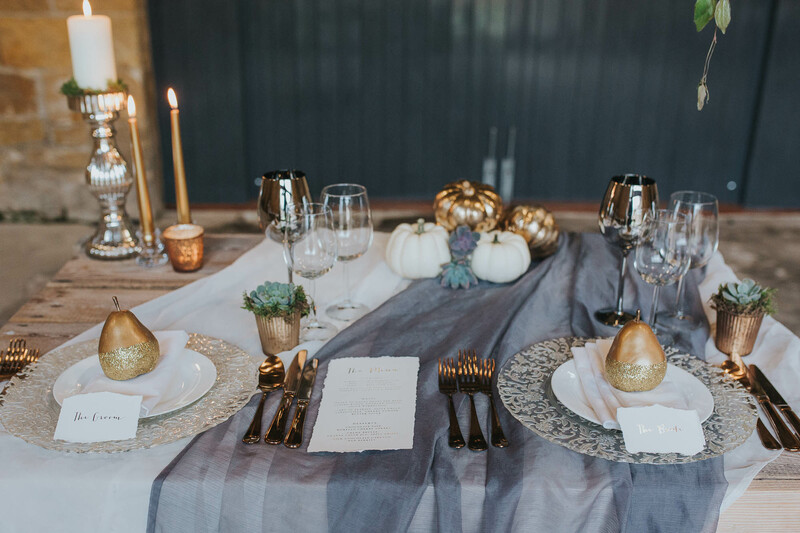 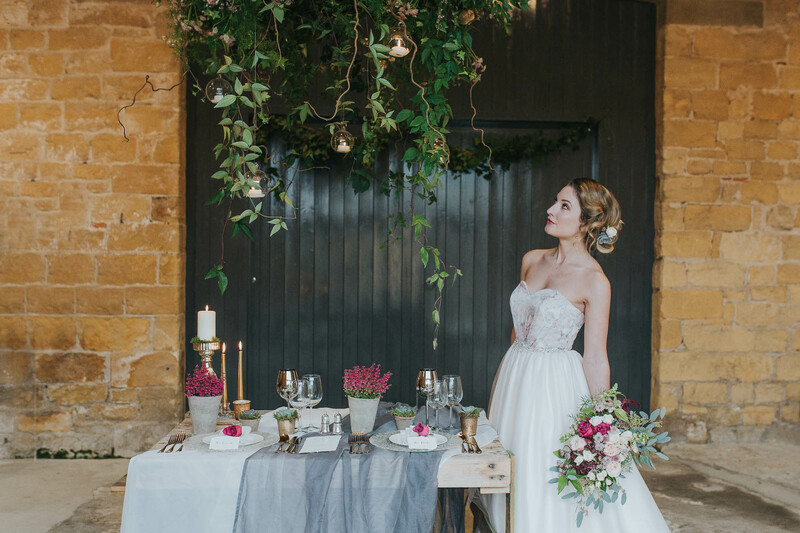 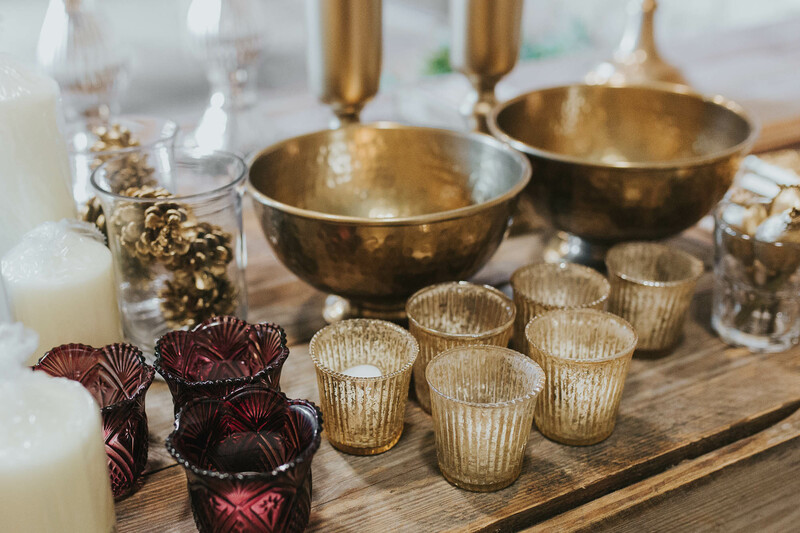 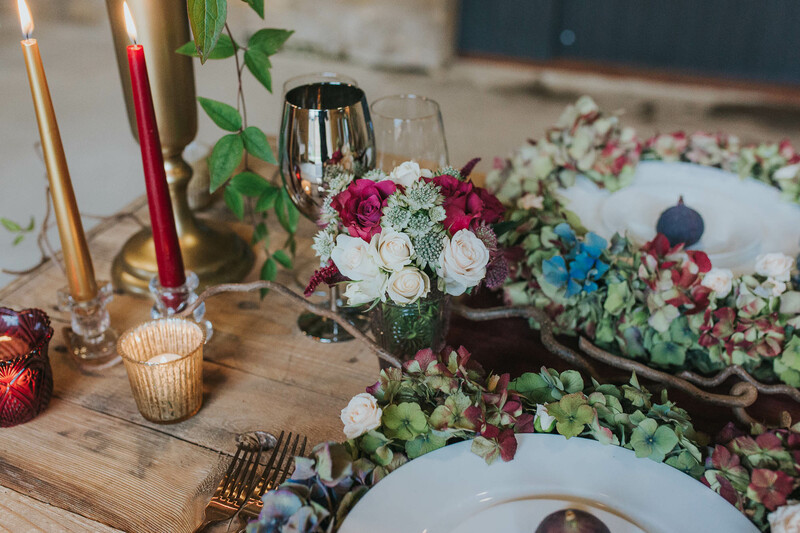 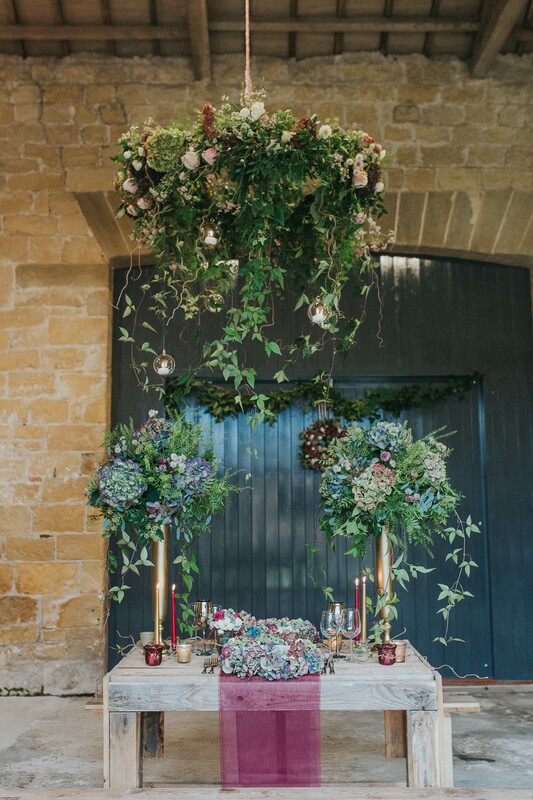 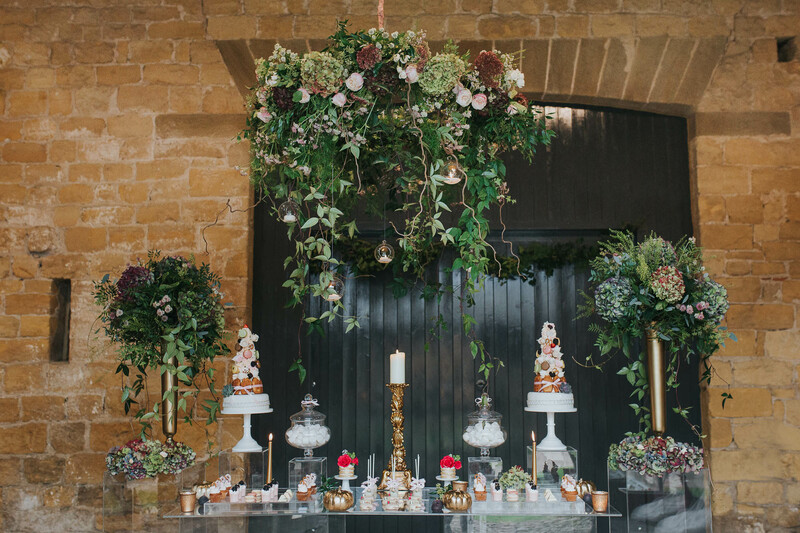 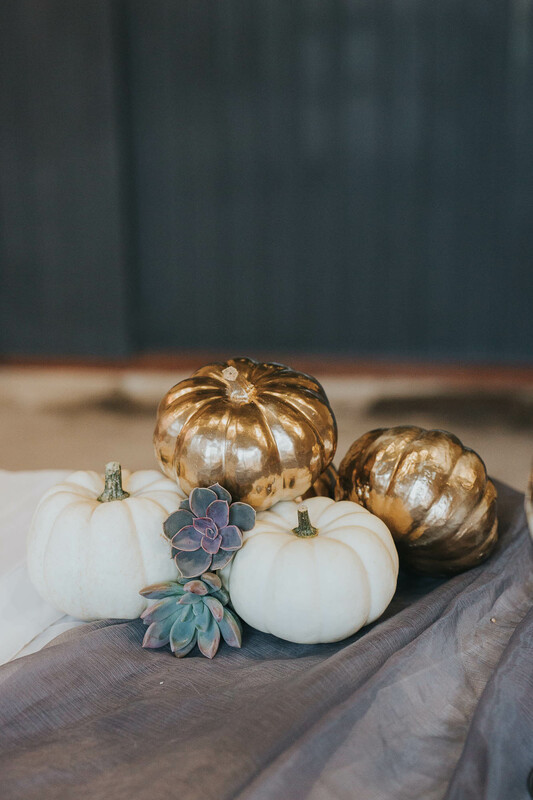 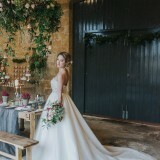 For the styling, we used gold icon vases, antique gold candelabras and floral hoops to make use of the roof space within the barn. 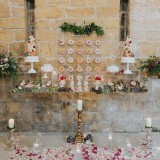 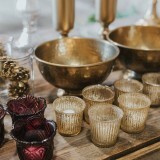 Extra details were added with votives, candlelight and fresh petals, all creating an opulent feel. 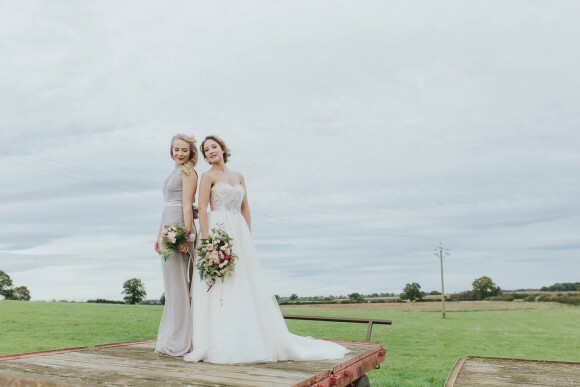 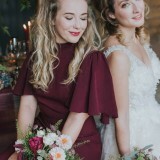 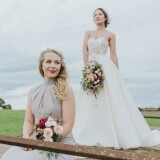 Our models, Phoebe and Eve, wore amazing wedding dresses designed and supplied by Charlotte Balbier and bridesmaid dresses by ASOS. 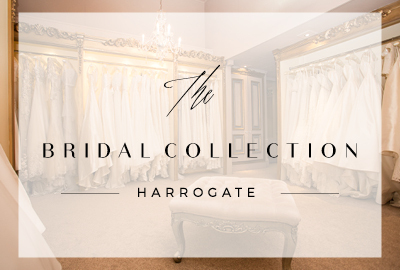 The wedding gowns had an elegant, timeless look with a touch of 1940’s/50’s Hollywood glamour. 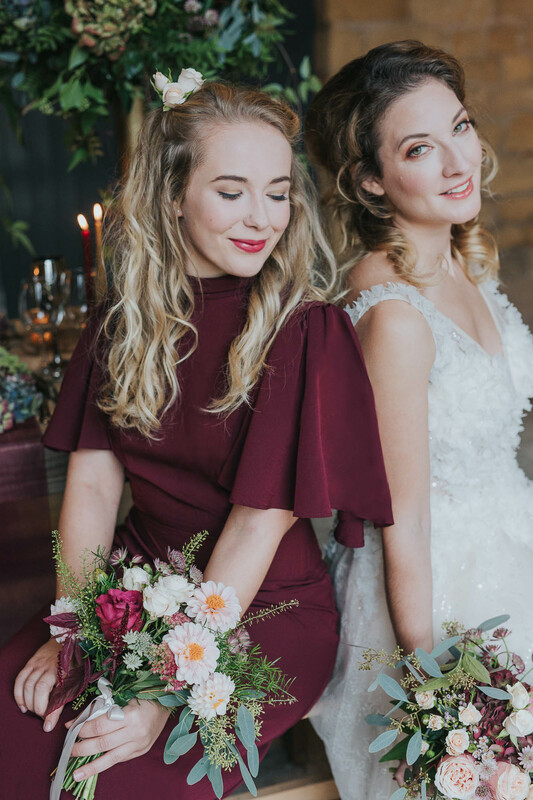 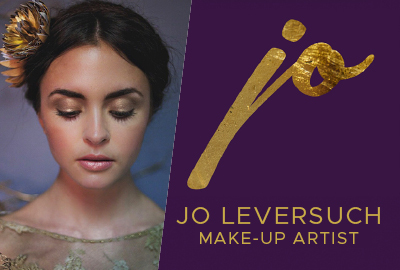 The makeup by Smink Make-up Artistry (who also styled the hair) was natural with an understated feel, yet achieved a glamorous look with berried tones. 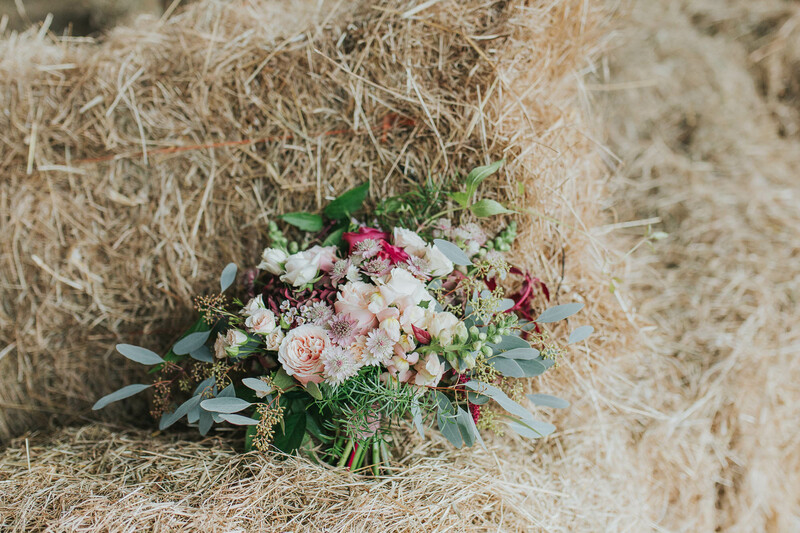 Taking into consideration the country setting, we wanted to add a natural feel yet cover every luxurious aspect of wedding styling. 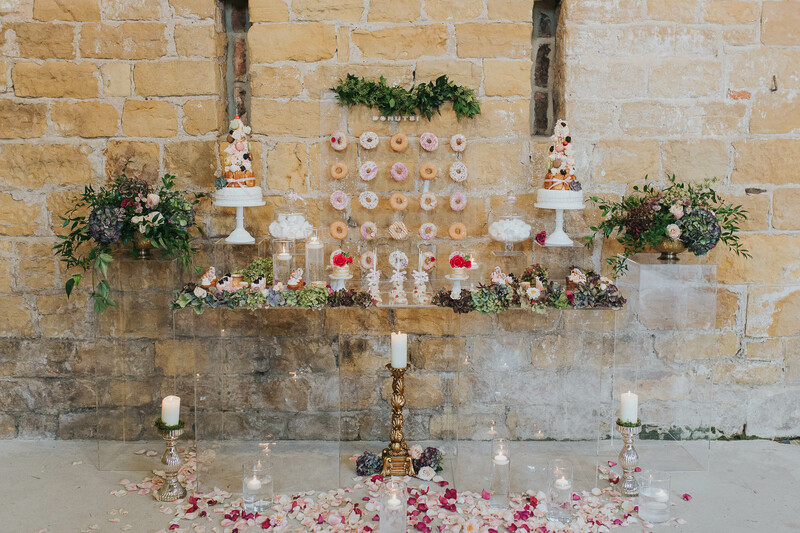 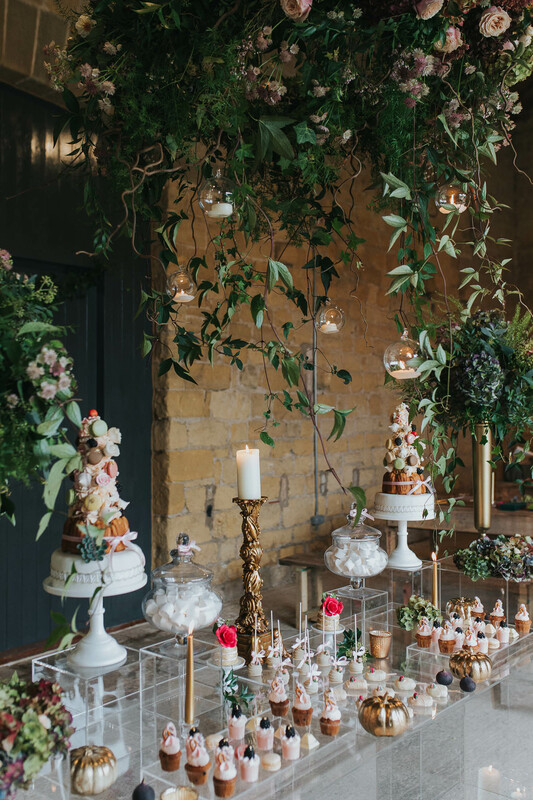 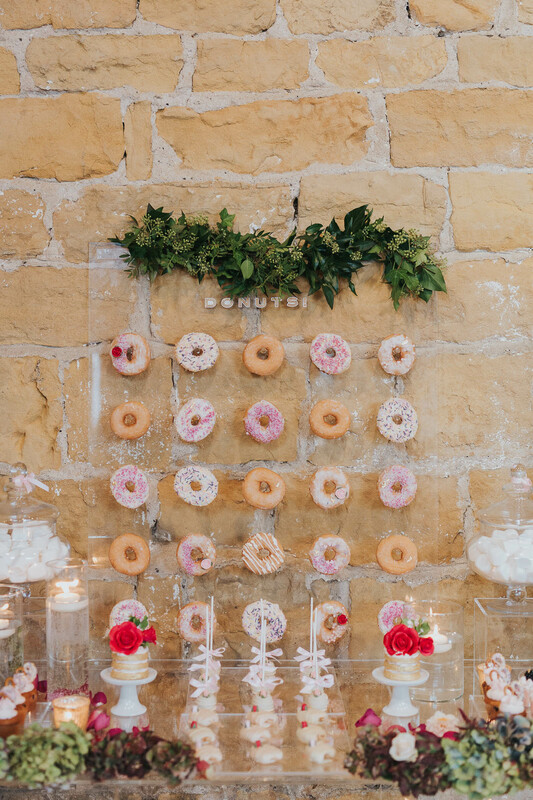 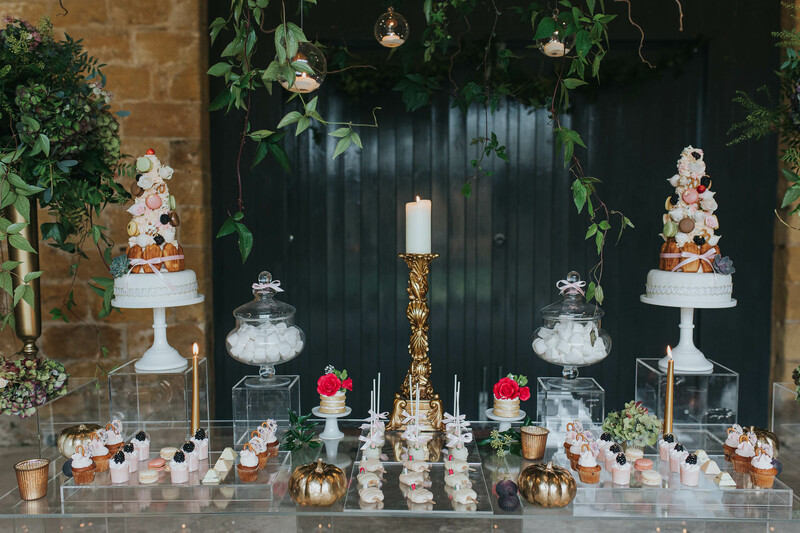 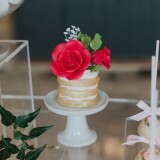 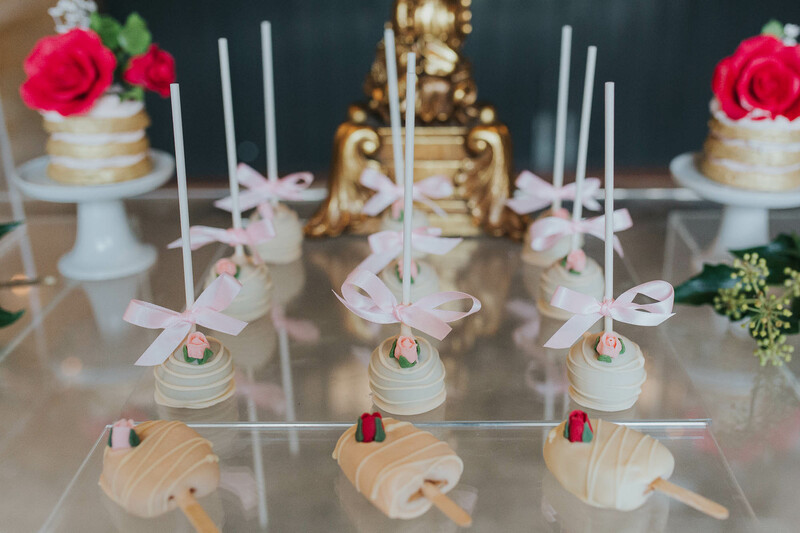 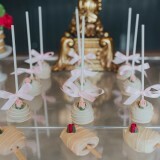 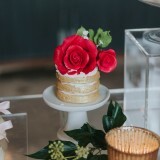 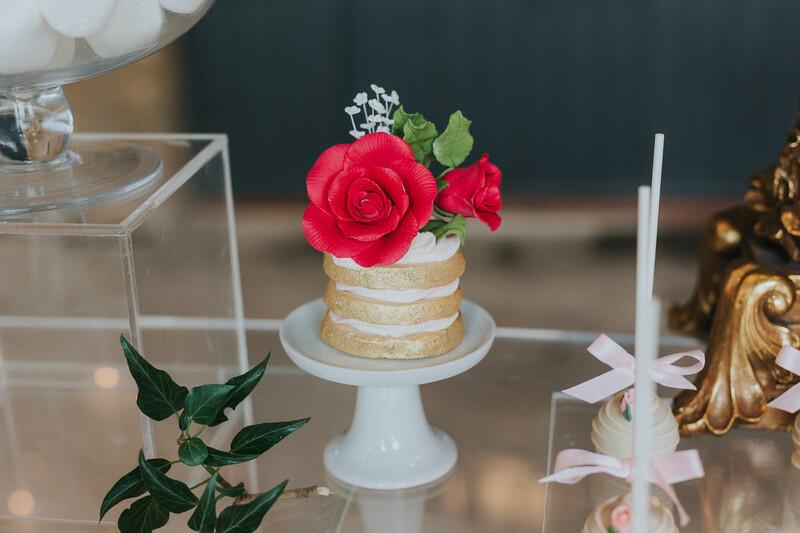 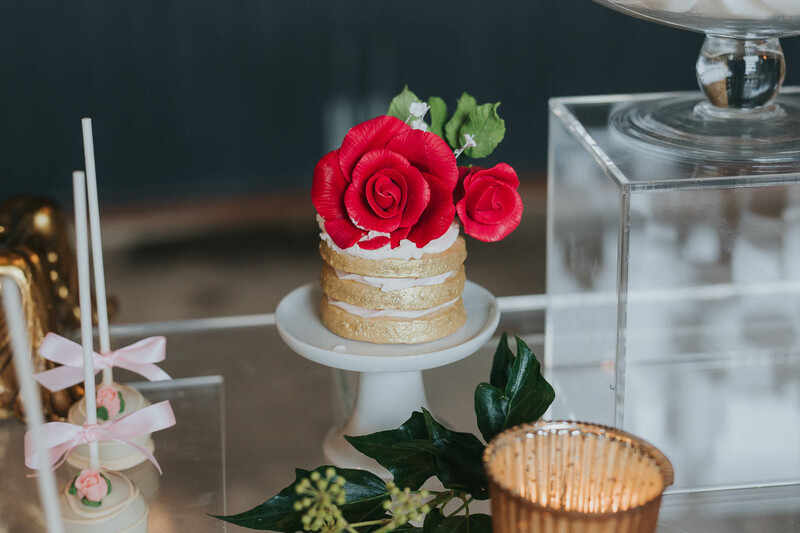 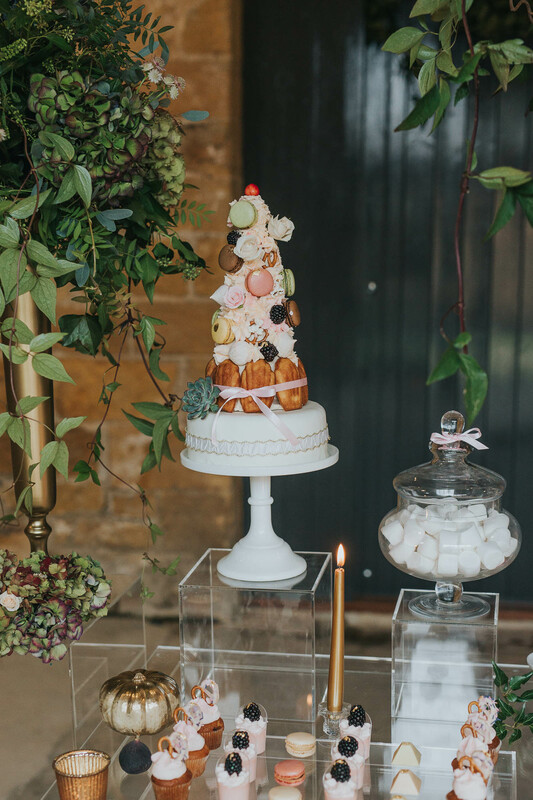 From a berried lip to the most over-the-top, amazing dessert table by The Whimsical Cake Company, we wanted to showcase how much beauty you can bring to a rustic setting. 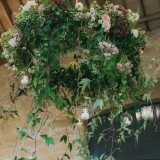 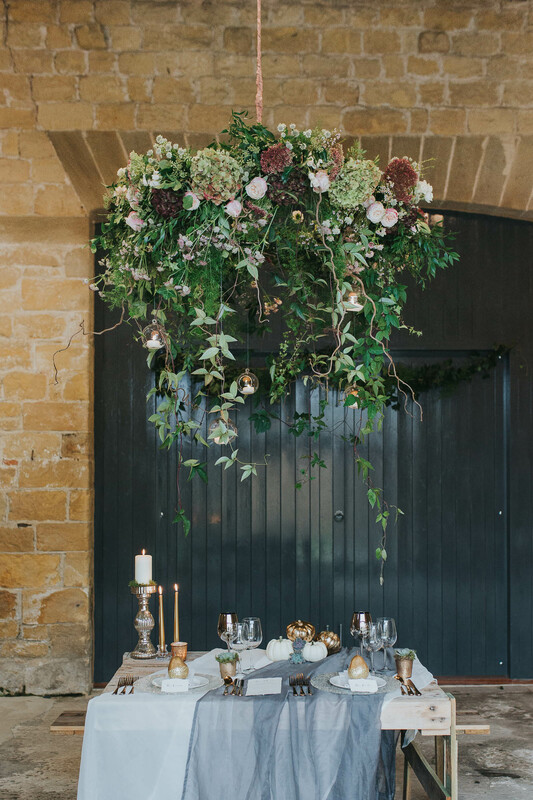 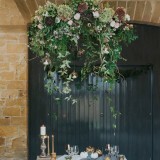 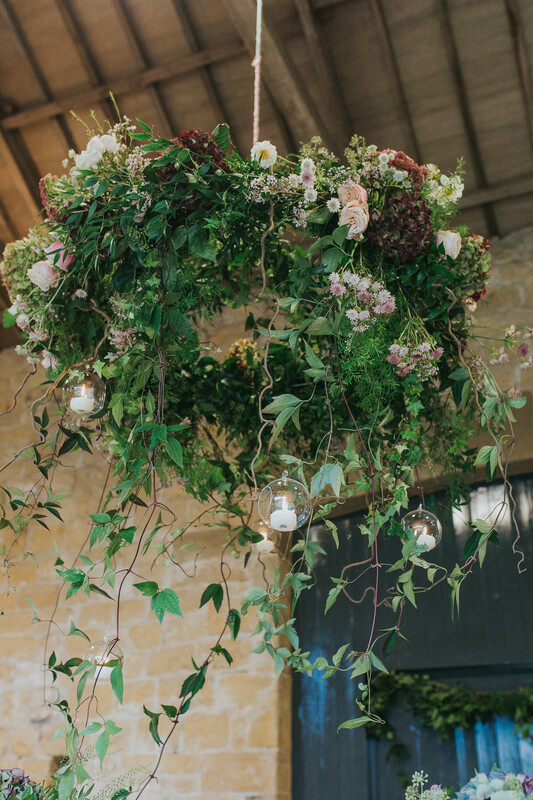 The hanging florals show off the season’s foliage and demonstrate how nature can be incorporated into your wedding setting. 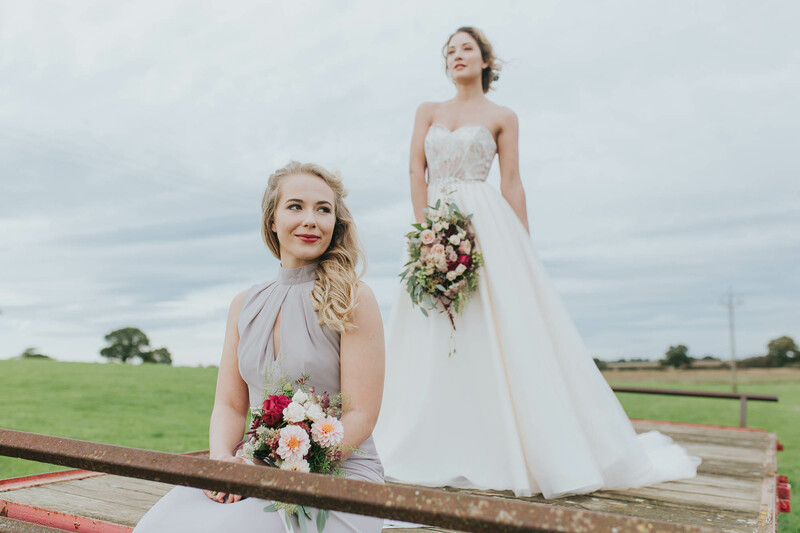 For the dresses, we went for all-out timeless glamour with stunning detailing and bold bridesmaid tones. 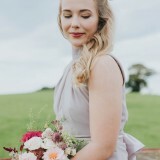 The photography by Laura Calderwood was natural, light and airy without a heavy filter to really capture all the tones and details of the day. 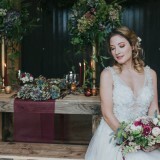 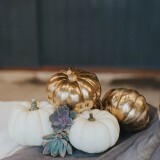 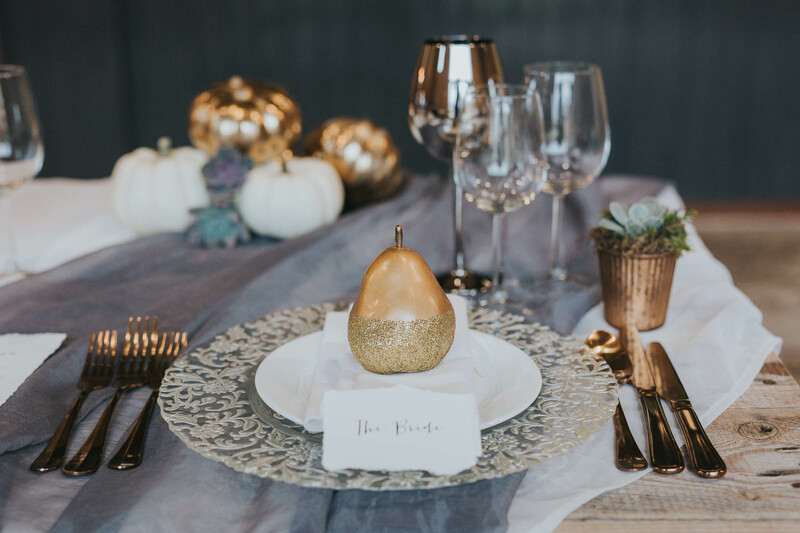 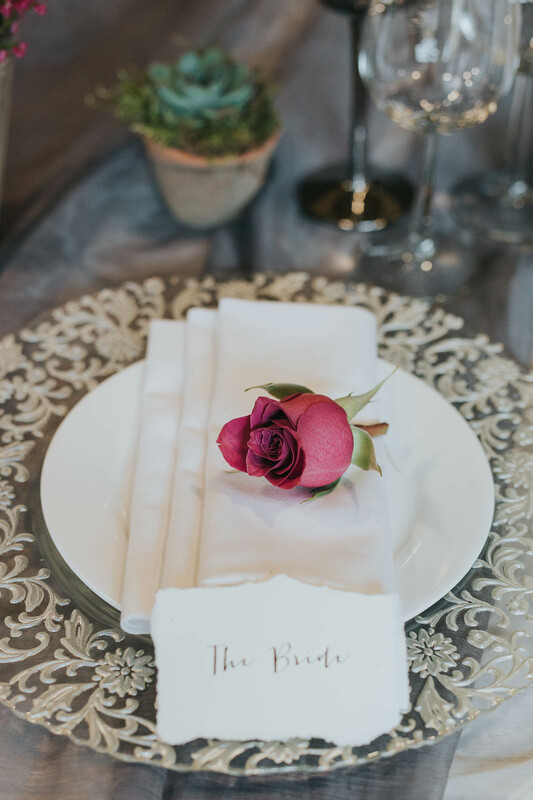 The aim was to embrace timeless glamour with lots of seasonal detailing and I feel we went above and beyond that, which shines through in the images. 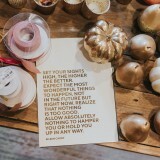 It was a really fantastic day; it was a great space to work in. 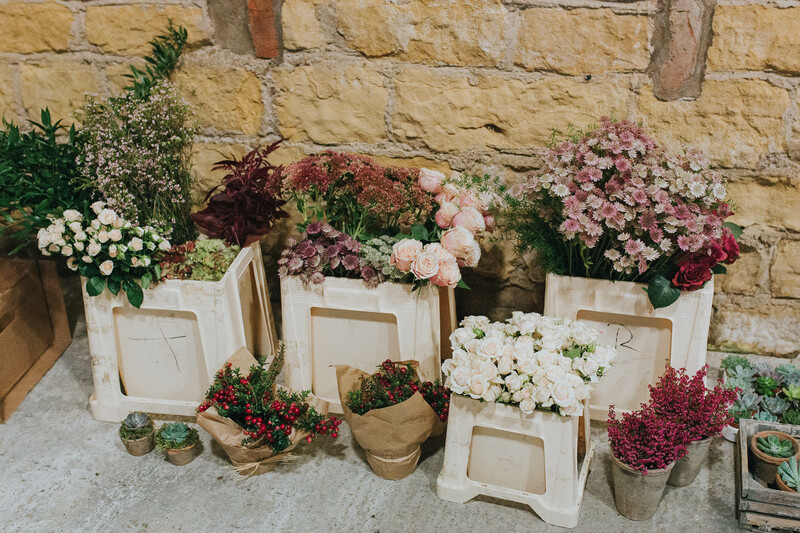 Rebecca of Castle Farm Barn granted us access to her farm-grown cut flowers and foliage, which enhanced the seasonal colours and the look we wanted to achieve. 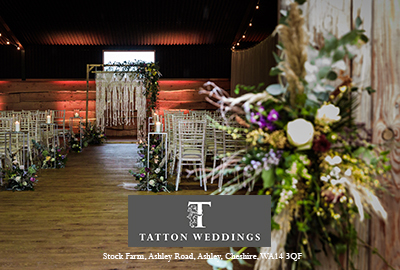 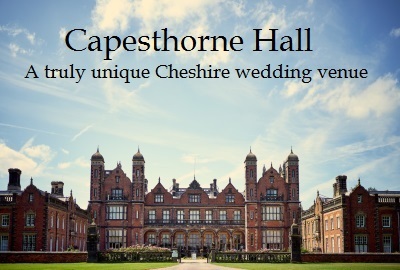 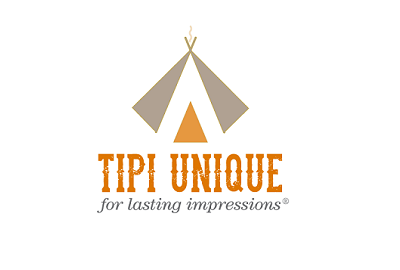 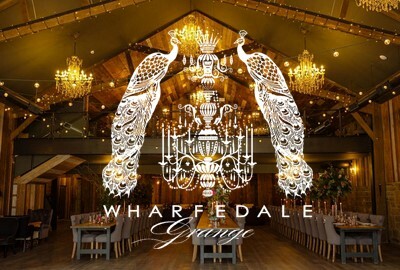 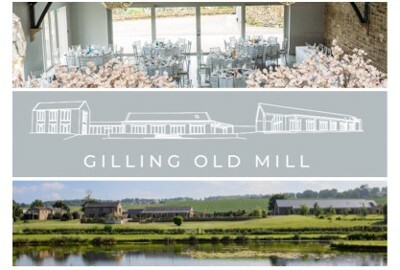 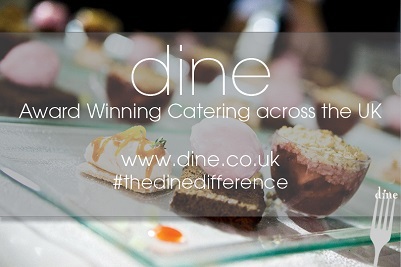 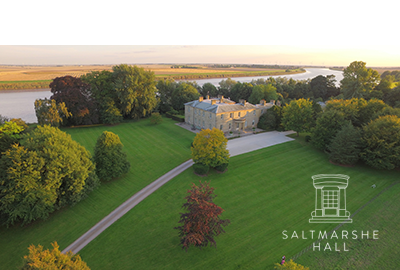 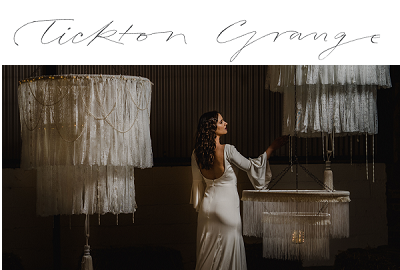 It was a great experience to work at an up-and-coming wedding venue and with such talented, passionate suppliers.